Suitable for Canon, Nikon, Pentax, Olympus, Panasonic, etc. 【Innovative LED Technology】This LED ring light uses innovative LED technology, high-quality LED light gives out gentle light which is close to natural light, 7 brightness modes can meet higher photograph needs. 【With LCD display & Controller】This LED ring light has a controller which has LCD display and buttons for quick and precise adjustment for brightness and mode. 【More Dimensional】The LED ring light' s left flash and right flash function makes objects in pictures appear more dimensional. 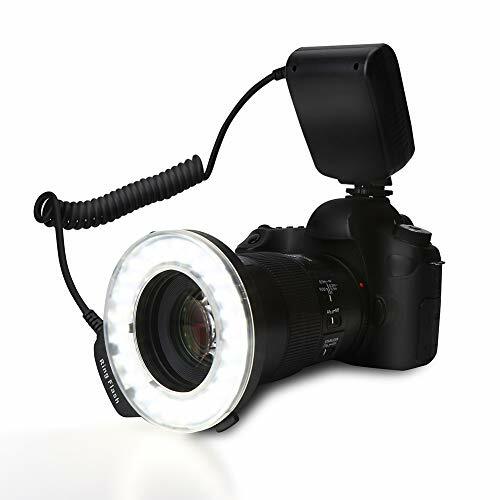 【More Shooting Styles】This LED ring light has 4 filters and 8 ring adapters, promise more shooting styles with different color temperature, and compatible with most cameras. 【For Photograph Lovers】This is a helpful accessory kit for photograph lovers, good for producing high quality photos.